"Aside from the intonation, rhythm, and tone, you play well." "It's a little bit 'nothing.' A little too casual." "Play, don't cheat, because that's exactly what I don't like." Ouch! Yet there is a certain kind of generosity in this kind of blunt assessment, a willingness to go straight for the blemish, and clean until it's clear. 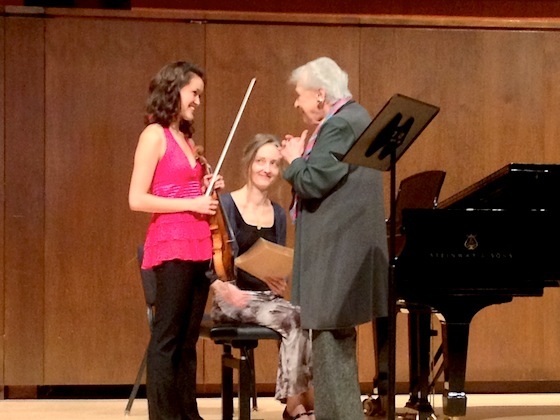 "Being nice, to me, is saying what I think," explained Sylvia during the master class she gave Wednesday at the Starling-DeLay Symposium on Violin Studies at The Juilliard School. I frankly wondered what she could possibly say to Gloria, 16, who played the first movement of the Sibelius with great poise. Her performance was pretty close to pristine, with many layers of polish already applied, and her posture was like that of a ballerina. 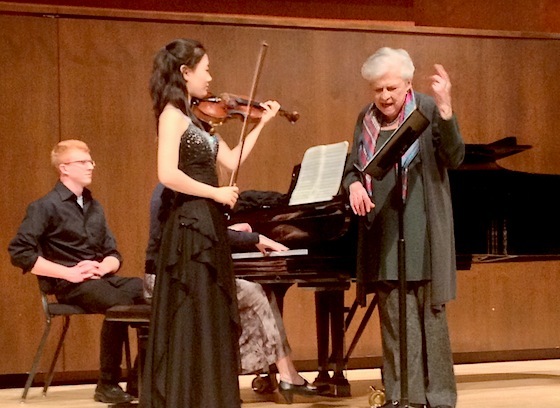 "This piece is played so often, I usually think 'Oh my goodness' when someone is going to play it again," Sylvia said. "I didn't think 'Oh my goodness' with you." This might have been the strongest praise of the afternoon. Sylvia wanted Gloria to stand more still, to stop rotating to the left when she played. Sylvia also shared her memory of living in Finland, where all winter long there was no light. Yet in June, there comes so much sun, all around the clock -- one day she saw the moon and the sun at the same time. The Sibelius concerto has something of that Finnish landscape from which its composer came. In talking about a diminuendo, Sylvia pointed out that Gloria does different bowings, in general, in this piece, than what she prefers. Gloria mentioned that she had referred to the urtext to see what Sibelius had written. "My dearie," Sylvia said, "if you are trying to do exactly what Sibelius wrote, you have to do the diminuendo!" She said she admired that Gloria had looked at the original score, but she finds that young people sometimes fall into a trap, obsessing over the urtext -- "It's a tendency of the young, 'holier-than-thou' student," she said. One needs to attend to the basics of rhythm and dynamics, above all. She expressed her support for etudes -- if you have some difficult chords, then just go for 10 minutes before bedtime and play a page of them, say, Dont No. 4. Students should also practice 10ths, 6ths and fingered octaves while they are still young and flexible, so as to be able to stretch that "duck-webbing" in the hand before it becomes more fixed with age. After practicing things like 10ths, one should practice thirds, to get the hand back into a normal position. Next came William, who played the "Danse Rustique" from Ysaye's Sonata No. 5 in G major, a solo piece. She wanted to hear it faster, with more precision, emphasizing the quirky 5/4 rhythm, which was unusual in the time the piece was written. William had the misfortune of not knowing with complete certitude what the word cédez meant in the music. It is unlikely that he will ever neglect to look up such a thing again. After threatening to go home on the spot, Sylvia said, "I really encourage people to learn 12 words in French, 12 words in German and 30 words in Italian, and go around the world." She she moved on and spoke of other things, but she didn't let it go: at the end of his lesson she suggested sending him to a French teacher for an hour! The other things she pointed out in the music: "Is this a person dancing on her toes or on her heels?" Sylvia asked. Her heels, they agreed -- it is peasant music, and full of open strings, too. In playing a double-stop fifth, which lacks the defining third, "can you make me wonder, is that going to be major or minor? There can be a moment of suspense," she said. These details have to retain their sense of wonder and spontaneity. "When we have a hard piece, we practice and practice," she said, "but we can't lose sight of the fact that it's special." Ji-Won, 16, played the first movement of the Brahms Sonata in D minor. Sylvia asked her to be more aware of when she is leading a section, when she is closing a section, and how it relates to the piano part. She also wanted her to get rid of unintentional accents and vibrato that causes an emphasis on the wrong notes. "You are too artistic to be betrayed by your fingers," she said. The climax of the first movement of the Brahms D minor sonata must be so compelling that "I want to hear -- like I MUST hear the end of that story!" Sylvia also drew her attention to the fact that the piano plays an "A" pedal over and over and over in the development, and that one must be haunted and obsessed by all those A's. "It's obsessive, in a good way," Sylvia said. "It has to get on your nerves a bit, it's there constantly." Next, Eric, 16, played both the Largo from Bach Sonata No. 3 in C major, and Paganini Caprice No. 24. 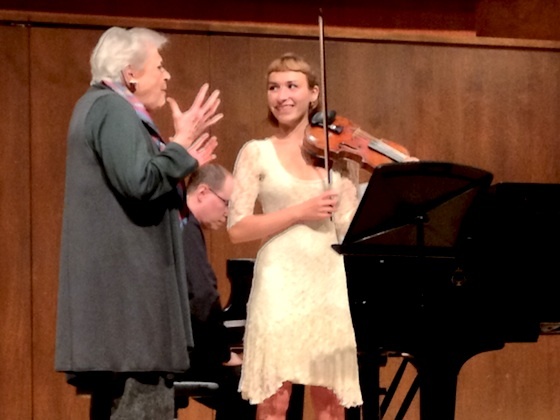 She talked mostly about the Bach, as time was beginning to run short in the master class. 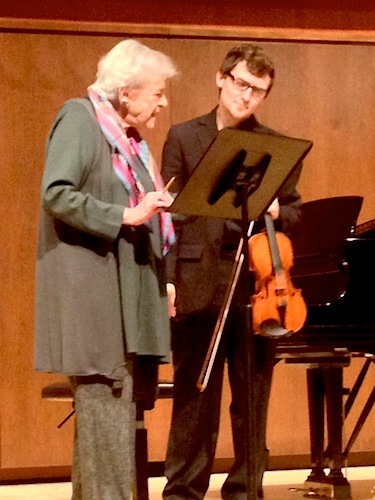 She spoke about Bach's intentions, "not that I've telephoned Bach lately," she said. But the clues are in the music, and one should be intentional about which voices should be brought out. In this piece and in others, she wanted voices separated during sections of question and answer, so there is no sliding or connection between notes during the transition from one voice to another. Each voice should -- and does by virtue of the way Bach has composed it -- have its own integrity. She emphasized that the codas in the Bach sonatas are always a fantastic commentary on everything that has happened in the movement. Lastly, Marié, 19, played the first movement of the Mendelssohn Concerto. Sylvia asked if she had learned it as a younger child, and she said she had. "Whether it's David, Joachim or Joe Blow, it's got a dash!" Sylvia said. She said that when one is trying to get a musical idea across better to the audience, not to think of exaggerating, think of projecting. May 30, 2013 at 09:54 PM · Great report, thanks! "Aside from the intonation, rhythm, and tone, you play well." - Hilarious! May 31, 2013 at 07:00 PM · So wonderful! My teacher sounds a bit like Sylvia and I love her tons. Thank you Laurie!